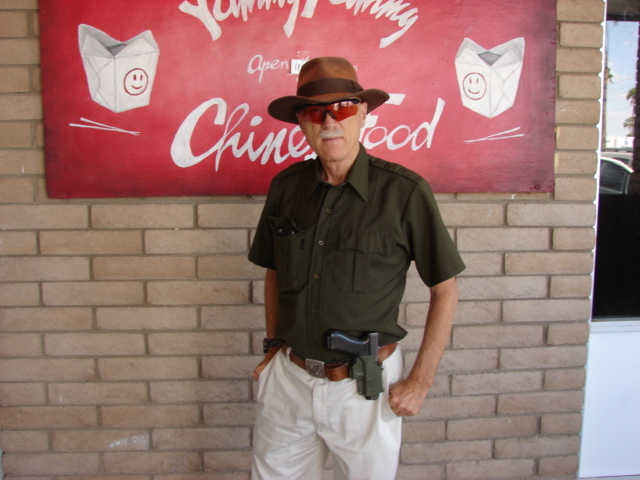 Read the article at http://gunwatch.blogspot.com/2015/05/open-carry-while-old-sick-and-tired.html and come to your own conclusions. I respect Dean Weingarten for his political activism but I have some issues with this article. Quotes from the article are ©2015 by Dean Weingarten and used under fair use. My slow pace and weakened condition made me an obvious target for human predators. Better that they be deterred by the presence of a gun than have to try to draw while under physical attack. A gun at rest is not a magic talisman that wards off evil. For the same reason, I moved the holster to a cross draw position, so that someone coming up behind me would have a much harder time grabbing the pistol and attempting a disarm. Someone trying to disarm a person of a gun isn’t so much Sijo the Ninja as they are Ogg the Caveman. In the photo posted above, I see two pieces of equipment missing from the open carry rig. A quality retention holster (Fobus doesn’t count…) and a small fixed blade knife (if legal in his area) on the complementary hand belt side. Another bonus was that it put the pistol between me and the shopping cart that I used as an aid in the grocery store. The shopping cart gave a little added protection and balance. Things like what time of day you shop, shopping with a buddy, where you park your car, and asking a grocery store clerk to help you load your car when you check out (it gives the clerk a phone/smoke break) can do more to improve your personal security when in the physical state that Weingarten describes than just having a shopping cart in front of you while in a parking lot. It is difficult to stay aware of the situation around you during a coughing spasm. I do not claim to have discovered any secret, foolproof method to protect yourself when you are old, sick, and tired. There isn’t any. But being armed gives you some chance. They do not call them “equalizers” for nothing. The issue I have with a “gear-centric” approach to personal security problems is that the approach often ignores “soft skills” and planning in favor of reliance upon the equipment. The question you should be asking is, “How do I minimize my chances of needing to deploy my hardware solution”? ‹ If you drive across the country with a gun, you need Waze!